In Spring Valley in eastern Nevada, the swamp cedar trees stand in somber silence. No more than a mile or so long, they are a narrow strip of sentries marking the place where, the Goshutes say, men, women and children belonging to the Goshute and Shoshone tribes were massacred in 1863 and again in 1897. In this hushed grove, the Goshute, along with the Duckwater and Ely Shoshone tribes, come to mourn and conduct spiritual ceremonies. Steele and the elders of his tiny tribe—out of 539 enrolled tribal members, approximately 200 live on the Goshute reservation in Deep Creek Valley, Utah—believe that where each murdered soul fell, the nutrients of their remains fed both physically and spiritually the swamp-cedar trees. “Otherwise you’d never see swamp cedar grow this tall and strong,” he says. That help is needed because the Southern Nevada Water Authority (SNWA) wants to run a multi-billion-dollar, 300-mile pipeline up to Spring Valley and four other valleys on the Nevada-Utah border—one of which, Snake Valley, is in Utah—to pump billions of gallons of groundwater to parched Las Vegas. The homes and ranches in Ibapah rely solely on reservation springs and streams to survive. Much-needed income is also derived from hunters attracted to the reservation by prolific herds of elk. 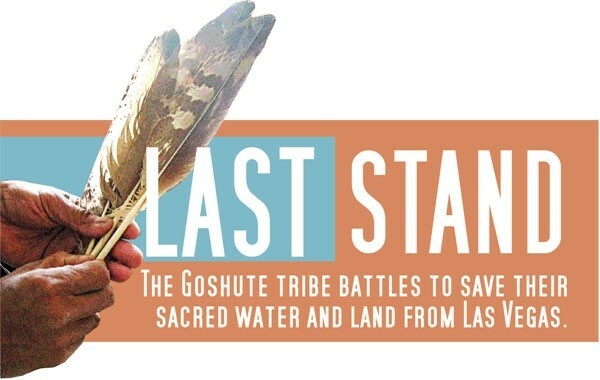 But beyond all that, the Goshute say their very religion and their right to pursue their beliefs and culture both on and off the reservation are at stake. Water is fundamental to the Goshutes’ beliefs, and they fear losing to Las Vegas’ thirst the sacred waters, around which their ceremonies revolve, that tumble down 11 streams from the Deep Creek mountain range. In the Goshute language, Steele says, water is referred to as a human being, a living entity. It is in the water that the spirits of their ancestors reside. If the water goes to Las Vegas’ fountains and man-made Venetian canals, the spirits will go there, too. SNWA’s Davis characterizes fears that his agency’s plans could wipe out the tribe as “hyperbole that doesn’t advance their cause.” Nevertheless, he acknowledges that the lack of pumping in rural Nevada means “we don’t have a lot of historical pumping to base projections on” as to how aquifers will respond. Deep Creek is a land swept by winds from both the north and the south. “This is where they meet and fight,” Steele’s father would tell him. This community is so small that everyone knows everybody else’s business. While the council and tribal members have fallen prey in the past to personal agendas and factionalism, before Las Vegas’ threat they have found a new unity. In March 2012, the Nevada State Engineer ruled that despite the protests of the Goshute tribe—along with those of other tribes, ranchers, the LDS Church and other local landowners—Spring Valley could be pumped in monitored stages by the SNWA. Only litigation, including an April 2012 appeal of the engineer’s decision by the Goshute and two Nevada tribes, and a shortly expected environmental-impact report by the Bureau of Land Management (BLM) stand in the way of a giant Las Vegas straw suctioning water from aquifers in rural Nevada near the Utah border. And no one knows for sure what the impact will be. According to hydrologist Tom Myers, who testified at the Nevada state engineer pipeline hearing in 2011, while pumping Spring Valley groundwater may not impact the reservation for 200 years, pumping Utah’s Snake Valley could have a much quicker impact, even if only a few feet. But in Ibapah, which has suffered increasing drought in the past decade, even a few feet could be devastating, say tribal members and nearby ranchers. Dan McCool teaches political science at the University of Utah and is an expert on water resources as well as American Indian voting and water rights. He describes the pipeline as part of the “hell-with-you” water policy that has long defined the American West’s attitude to owning natural resources rather than sharing them. “There is absolutely no legal, ethical or moral cognition of what impact this has on other people,” he says. Though a passel of organizations and communities—including Salt Lake County—originally protested the plan, no one in government, it seems, is currently stepping up to protect the Goshutes. The Goshute are a sovereign nation, with their own tribal government, but Steele says when it comes to negotiations, whether with federal or local government, “they always put the Indians on the back burner.” Steele says part of the U.S. government’s treaty with the tribe involved the feds providing “welfare and safety for perpetuity.” Yet the federal entities charged with doing this, most notably the Bureau of Indian Affairs (BIA) and the BLM signed a stipulated agreement in 2006 with SNWA withdrawing protests to the project, without consulting the tribe. According to the Las Vegas Sun, a BIA director said that the timing of negotiations between the federal agencies and the SNWA did not allow for consultation with the tribe, a claim tribal leaders dispute. The BIA did not respond to e-mailed questions for this story.